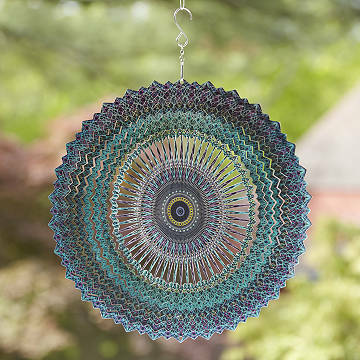 Inspired by traditional Asian mandalas, this vibrant piece spins and "radiates" from its center. Is it just us, or is meditating easier on a beautiful, breezy day? Set your intentions—whether to find inner calm or pay attention to nature—in motion with these mesmerizing designs. Inspired by classic Hindu and Buddhist mandala imagery, the twirling metal pieces come flat and pop out in layers to reveal a vibrant three-dimensional design. When the wind blows, they spin blissfully, and "radiate" from the center. Give the soothing piece to your favorite yogi or friend with a calming presence. Made in China. 7" H x 12" dia. We were impressed by the beautiful design and quality workmanship. Appears it will last indefinitely. Colors are lovely. Stainless steel is light and strong. Easy to install and hang. I ordered the "cool" color wind spinner bc the "warm" color was out of stock. I didn't open the package and returned right away. The image looked screen printed, not hand painted (as the warm one does) and, the center piece has a large diameter ~ 7"? so, there did not appear to be too many smaller circles spinning within slightly larger circles. I assumed the products would be more similar, despite images to the contrary. It was just not as visually appealing. Got one cool and one warm. I love the colors and shape of this one but it doesn't pick up the breeze as well as the warm one. Hoping I can readjust the spacing to get it to spin more easily. Still a very nice addition to my porch. Spins beautifully in just a little breeze. Looks beautiful. First spinner I bought was slightly bent when I received it. But you all looked at my pictures I took of that spinner and said not a problem to exchange. And by doing so I actually ended up with the color and design I actually wanted to purchase at the time but in December y'all were sold out. So it all worked out in the end. This gift was perfect for my BFF because she loves to sit on her front porch to read, write, or play music. She calls it her happy place and loves thE wind spinner. I wanted to keep this for myself!!! This is a beautiful chime that's unique. Great house warming gift.